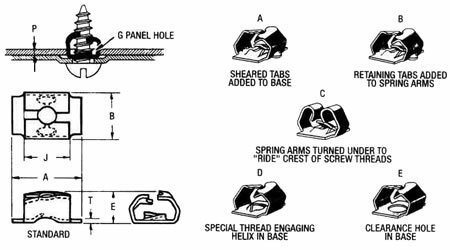 Self Retaining Speed Nuts | Self Retainers & Spring Clips - Bolt Products, Inc. - Bolt Products Inc.
Self-retaining speed nuts, also known as self retainers and spring clips, are the only fastening devices that provide a compensating thread lock as well as a self-energizing spring lock. Two distinct forces are exerted on the fastening screw as the self retaining speed nut is tightened. A unique dual locking spring clip action. Ease of application and reduced assembly time. Resistance to loosening from vibration. Maximum holding power with minimal installation torque required. Ideal for blind assembly or hard-to-reach installation, the self retaining speed nuts come in numerous standard designs and special variations. Contact Bolt Products to request a quote for self retaining speed nuts today.